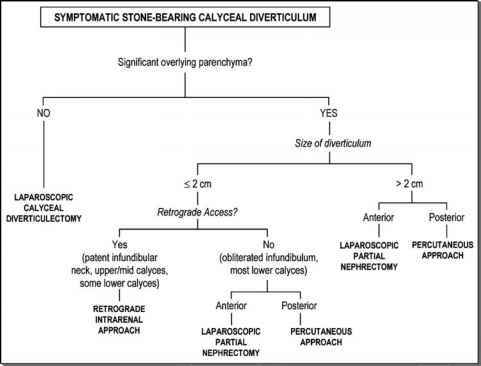 FIGURE 1 ■ Patient-selection algorithm for symptomatic stone-bearing calyceal diverticula. When there is significant renal parenchyma overlying the diverticulum, a formal laparoscopic partial nephrectomy offers the best chance for definitive management of the calyceal diverticulum, as well as for a watertight and hemostatic end result. several factors including size and location of the diverticulum, likelihood of requiring a partial nephrectomy, and patient-related factors (prior surgery and body habitus). 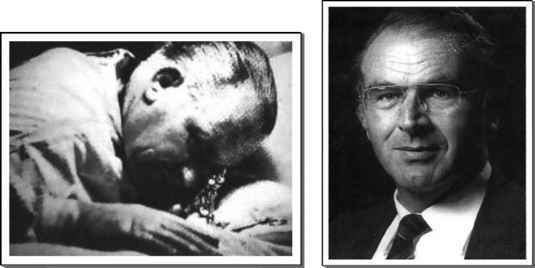 Most lesions with thin overlying parenchyma are amenable to laparoscopic calyceal diverticulectomy. ■ Larger lesions (greater than 2 cm) can be adequately accessed from either the transperitoneal or retroperitoneal approaches. In these cases, the risk of bleeding is low because there is minimal renal tissue excised. Furthermore, with complete renal mobilization, adequate suturing angles to the diverticular infundibulum can be created from either approach. However, for smaller lesions, the angle toward the diverticular infundibulum becomes more restricted, and therefore anterior lesions should be approached transperitoneally, whereas posterior lesions should be approached retroperitoneoscopically. The technique of laparoscopic partial nephrectomy in this setting is identical to that for renal masses. Several caveats regarding selection of method of laparoscopic access have arisen from a large comparative study between transperitoneal and retroperitoneal laparoscopic partial nephrectomy at the Cleveland Clinic (19). A transperitoneal approach to laparoscopic partial nephrectomy provides increased working space and improved suturing angles for renal reconstruction, and should be the approach of choice for substantive or deep resections, and for all anterior, lateral, or apical lesions. The retroperitoneal approach to laparoscopic partial nephrectomy should be reserved for smaller, more superficial lesions that are directly posterior or posteromedial. This is a rare situation in the setting of calyceal diverticula, because the majority of such lesions can be managed successfully with a percutaneous approach. Patients undergoing laparoscopic management of symptomatic calyceal diverticulum should receive the same preoperative regimen as any laparo-scopic renal surgery patient.